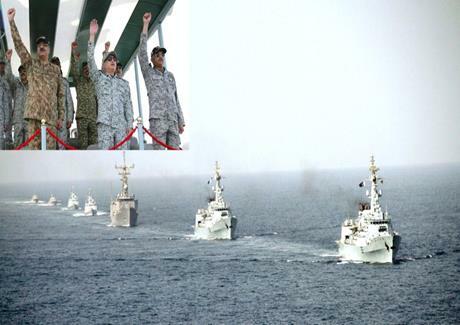 Pakistan Navy Destroyers, in an impressive display on Friday demonstrated their fire power (Missile Firings) in North Arabian Sea. Chairman Joint Chief of Staff Committee, General Zubair Mahmood Hayat, as the Chief Guest witnessed Live Weapon Firing from PNS MOAWIN; a newly commissioned Combat Logistic Support Ship. Chief of the Naval Staff Zafar Mehmood Abbasi on the occasion said Pakistan Navy is ready in all respects to defeat any misadventure and aggression against the country in Maritime Domain. The event was conducted at the culmination of Sea Phase of Major Maritime Exercise Seaspark-18. The Exercise was conducted to validate war fighting concepts under hybrid threat environment involving support of PAF and Pak Army. Chief of Air Staff also appreciated the joint operations especially enhanced coordination between PN and PAF in Maritime domain. The Anti-Ship Missiles were successfully fired by Pakistan Navy Ships SHAMSHEER and SHAHJAHAN. The live firings at sea remained highly successful as both missiles hit their targets affirming PN war fighting capability.